Under Section 261.101 of the Texas Family Code, persons are required to report if they have cause to believe that a child’s physical or mental health or welfare is being or has been adversely affected by abuse or neglect. The report is to happen immediately (or within 48 hours if the reporting person is a professional). The law further grants “immunity” to the person who reports or assists in the investigation if that person had “good faith” when they made the report. What is a “Good Faith” Report of Child Abuse or Neglect? Put simply, a “good faith” report is an honest and sincere report. The law wants to encourage folks to report so that the State can investigate and ensure that children are not being abused or neglected. However, falsely (or without good faith) reporting child abuse to CPS or other agencies is not to be used as an act of retaliation or aggression toward others. A false report damages the child’s welfare in itself because the child will be subjected to an investigation where none should have been pursued. Unfortunately, we have seen this occur in the context of highly contested family law cases and in some criminal cases as well. More recently, there were allegations of a false report made to smear a political opponent. What are the Legal Penalties for Falsely Reporting Child Abuse or Neglect in Texas? Knowingly making a false report of child abuse or neglect in Texas is a State Jail Felony offense. The punishment range for this offense is 180 days to 2 years in a State Jail Facility and a fine up to $10,000. Further, if a person has been previously convicted of this same offense, a second offense is a Third Degree Felony which subjects the person to a prison term of 2 years up to 10 years. As a monetary penalty in connection with the criminal case, the court shall order any person that is convicted of making a false report to pay the reasonable attorney’s fees incurred by the person against whom the report was originally made. 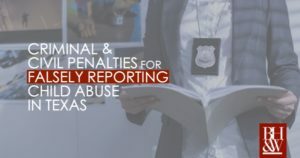 The Family Code further provides that any person who engages in false reporting is liable to the State of Texas to pay a civil penalty of $1,000. The Texas Attorney General is responsible for bringing the action to recover the civil penalty. What Do I Do if Someone Has Made a False Report to CPS About Me? First of all, contact an attorney. Depending on the posture of the investigation, you may need representation and advice to help get through the allegations, even if they are false. If, however, CPS has already ruled out the allegations and no criminal action has been pursue, you should first gather your evidence. We have been with people at the police station when they made reports that they had been targeted by false CPS allegations. It is our experience that the police agency will want you to bring proof that the report was false or made in bad faith. Simply because CPS closed out the investigation and determined that there was “No Reason to Believe” that the allegations were true does not necessarily mean that the reporting individual acted in bad faith. Collect your text messages, social media messages, witness statements, and other evidence before you go to the police station to claim that you were the victim of a knowing false report. Because the State wishes to encourage reporting, it is reluctant to punish a person who reports unless there is clear cut evidence that the report was made in bad faith. Again, it is best to contact an attorney to help you through this.